Please plan to arrive in Friday Harbor on no later than Friday morning. Some guests looking to extend their stay in the islands may wish to come to Friday Harbor on Thursday. This is a great option, and you can find many wonderful winter deals on lodging. If you arrive on Friday, please plan to arrive in the morning so that you have time to check out the town, and also grab lunch before boarding Hopscotch at 1PM. Drive to the Anacortes Ferry Terminal and walk onto the Ferry for Friday Harbor. There is no need to drive your car across the ferry, as the ferry dock is next to where Hopscotch is docked. 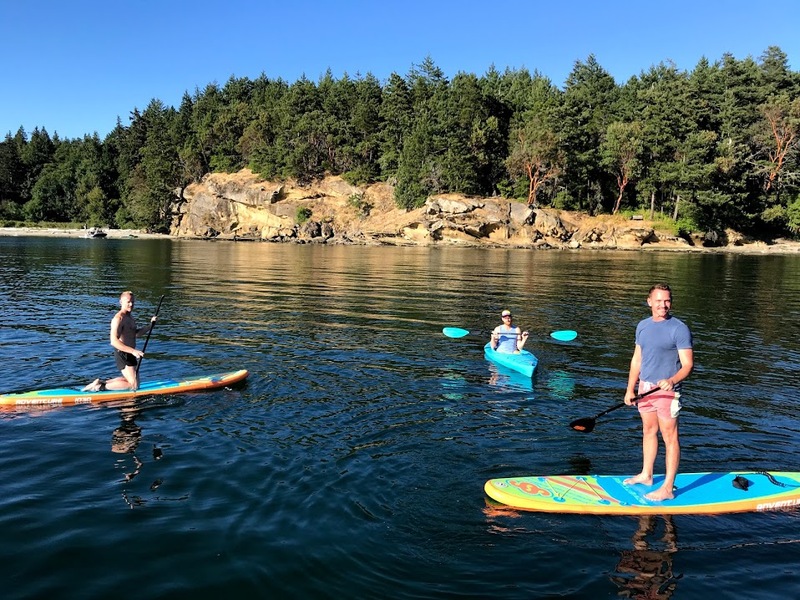 Please consult the current Washington State Ferry Schedule and note that you’ll need a few extra minutes to find parking, and purchase your Walk Aboard tickets in Anacortes. Don’t be late! There is a ferry leaving at 10:20 AM from Anacortes that we recommend you be on. Depart the dock and head North up San Juan Channel. We’ll be on the lookout for Humpbacks, Porpoises, and other Marine Wildlife. We’ll also cruise past Speiden Island where (if we’re lucky) we’ll see Mouflon, Fallow Deer, and Sitka Deer. Roche Harbor has lots to see and do. Along with several places to grab a snack (or famous Donuts!) you can also pick up anything you need (drinks, toiletries, etc) at the Roche Harbor Store. For those of you who prefer to shower on dry land (instead of Hopscotch), Roche Harbor boasts some the nicest showers in the islands…but you’ll need some quarters (available at the store)! You’ll have a couple of hours to explore, walk, shop, or just relax. A few of our favorites activities are hiking to the Mausoleum, and taking a stroll through the San Juan Sculpture Park. Dinner tonight will be locally caught Salmon prepared in a special Asian-style marinade which will have your taste-buds dancing with delight. The entree will be served with roasted potatoes, greens, and topped off with a coconut based flour-less chocolate cake. Coffee is on! If you are an early riser you’re certainly welcome to get up at dawn and walk the docks, shower, and explore! However, we ask that you “keep it down” (library voices) until 8 am…some guests like to sleep in! We’ll have coffee and a special sweet treat at 7:30. Feel free to stretch your legs and explore until 9am! Breakfast! We’ll have a great spread of sweet and savory! Depart Roche Harbor and head south through Mosquito Pass. We’ll be sailing on the West Side of San Juan and Henry Islands. Heading north of Haro Straight we will be on the look out for transient and resident Orca Whales! This is prime territory and we’ll cross our fingers that we get lucky and haven an encounter! If conditions allow, we will have lunch underway, around 12:30 PM. We’ll arrive in Reid Harbor on Magical Stuart Island! This is your time to get out and explore all the magic that Stuart Island has to offer! Brendan will be happy to show you the way to the enchanting old School House, and Teacherage Museum. For those who really want to stretch their legs, a hike to the historic turn point Light Station is always a great walk! And for those looking to gain some elevation, Brendan will show you the path to Tip Top hill…the best view in the San Juan Islands! Come warm up with a hot drink, and a campfire! We’ll have a toasty campfire, some snacks, drinks, and maybe even a hammock or two to help you warm up and relax after a day of adventures! Tonight’s dinner is one to remember! Chef Branden will make his famous Local Salish Sea Baked Halibut, Broccolini and Wild Rice. Dessert will just have to be a surprise! 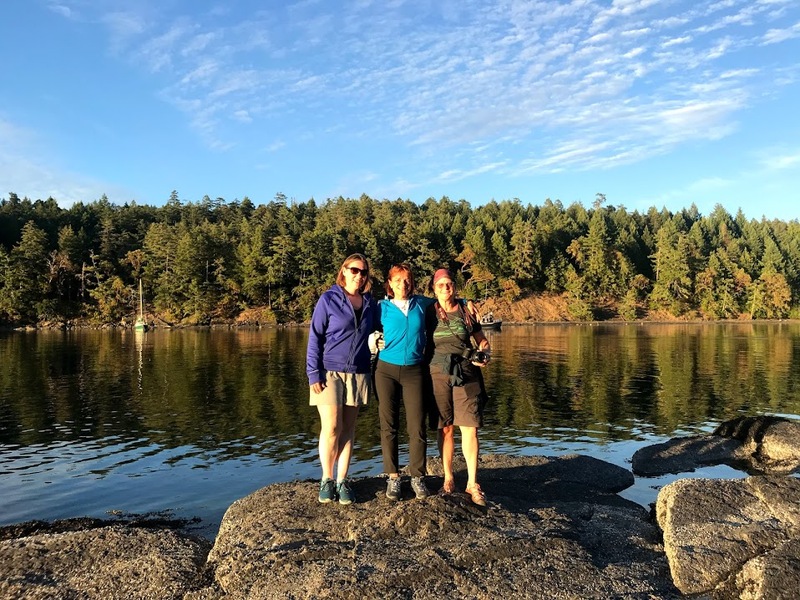 Coffee is hot and ready for you to take on one of the incredibly beautiful hikes that start and end at the State Park Dock. Enjoy a 20-30 minute walk that will take you through madrona forest, old growth, and coastal rain forest. We depart Stuart island and have a lovely Brunch underway. We’ll sail up the Northeast Side of Speiden Island and then down San Juan Channel back to Friday Harbor. We’ll arrive back in the town of Friday Harbor. You’ll be back in time to catch the 12:10 Ferry back to Anacortes. Or if you’d prefer to grab lunch in Friday Harbor, you can catch the 3:40 PM Ferry. Most importantly, we ask that you pack your luggage in a soft sided bag. Hard sided Luggage takes up too much space aboard Hopscotch. We don’t recommend flip flops, or other sandals that can easily get caught on lines or edges of the boat. We have plenty of blankets, umbrellas, (extra) gloves, and other items to keep you warm! Hopscotch is dry and warm, and you can always “get out of the weather” if you want to. 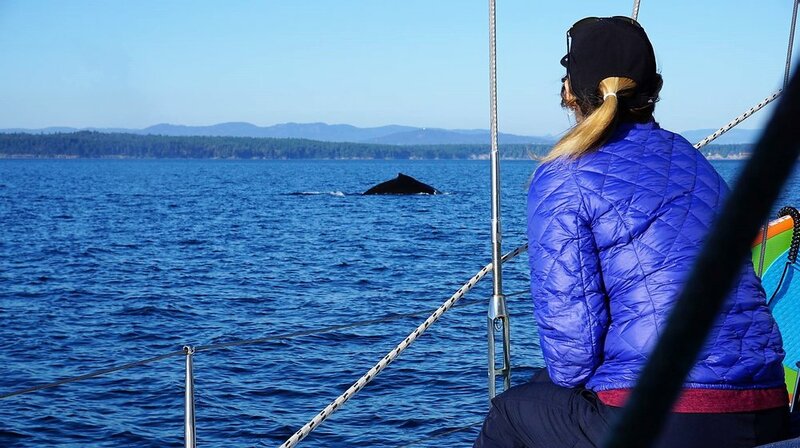 However, there are moments when we might have some chilly weather (or wet) coincide with an amazing situation (whales, or other scenic opportunities) where you will want to be on deck. It’s also quite enjoyable to be outside when we are under sail. So, we recommend that you bring clothing that you might where if you were going for a walk in the Pacific Northwest in the winter time. Each stateroom has a head (boat for bathroom), and the head is also a shower. Most guests prefer showering on shore, but it’s not a problem to shower on board too! All food: meals, snacks, treats, etc, is included. 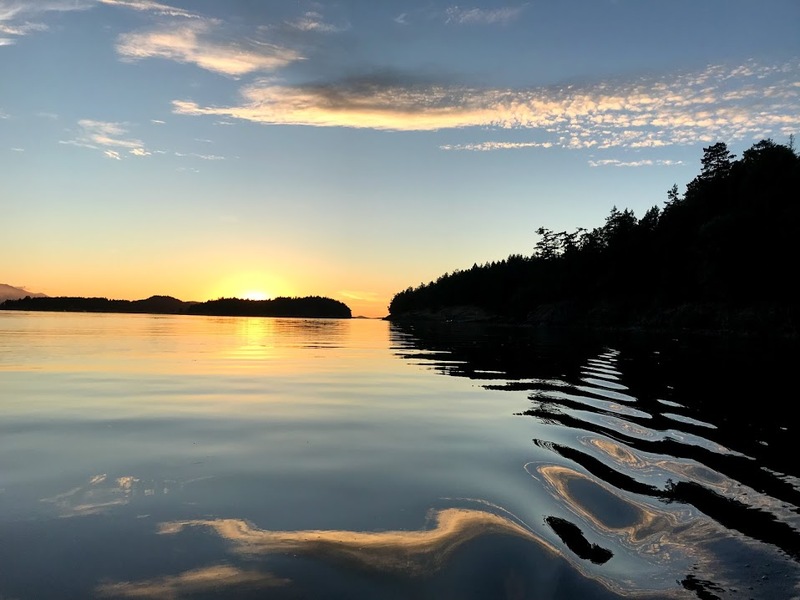 Your first meal will be Dinner on Friday Evening (you are responsible for Lunch in Friday Harbor), and our last meal on board is going to be Brunch on Sunday morning. Any alcohol you wish to consume on board. We will gladly store wine and beer and liquor on board, but we cannot supply it to you. There are several stores in Friday Harbor to purchase any alcohol you wish to consume. And there is also a store at Roche Harbor where you can “re-supply” on any alcohol, or purchase any other items you’d like to. In the Charter Industry a 15-20 % gratuity (on the original cost of the charter) is customary if service was excellent. If service was less than excellent, we ask that you speak with us about it. We love meeting our new guests, but please remember: we will likely be very busy with last minute PREPARATIONS for your adventure with us. So… if you show up early to Friday Harbor, feel free to come down and say hi, but unfortunately we won’t be able to take luggage, or other items on board until we meet for your departure. We’ll also be very busy doing our “finishing touches” on hopscotch, so we cannot allow guests on board until we’re all “Ship Shape”.